Posh defender Jack Baldwin attempts to tackle West Brom's Stephane Sessegon at the Hawthorns. 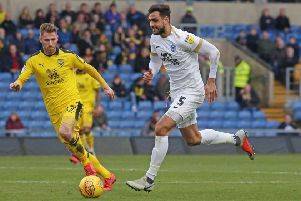 Posh players unavailable include central defender Ricardo Santos (suspended), right-back Michael Smith (suspended), new striker Tom Nichols (cup-tied), and attacking midfielder Adil Nabi (ineligible). Central defender Jack Baldwin is rated no better than 50-50 to return from a back injury suffered in the original tie at the Hawthorns. Marcus Maddison scores for Posh against Luton in the second round of the FA Cup. Midfielder Harry Beautyman could be asked to fill in at right-back, while centre-back Gaby Zakuani could start despite seeing just 15 minutes of first-team action - as a late substitute in the 1-0 win at Chesterfield on Saturday (February) since the beginning of November because of a serious hamstring injury. Winger Marcus Maddison will be available after missing the trip to Chesterfield because of illness. Westley said: “We have suspensions, cup-tied players and injuries. It will be an unfamiliar line-up. “Rest assured I won’t rest anyone. It will be the strongest team I can play. It might be unusual in its shape and in personnel, but it will still be a team full of quality, determination and desire. “Jack Baldwin is very sore. He’s touch and go, probably 50-50 to play. He was out for a long time so he won’t want to miss any more games easily. We will try all we can to get him fit. We will try and make it 60-40 him playing tomorrow and then 70-30 on Wednesday. It was a nasty fall he suffered at West Brom though. “Gaby Zakuani is an option. It might seem like it’s too early for him, but trust me Gaby was wanting to play the morning after his operation so he will be ready if needed. “It’s a shame for Michael Smith and Ricardo Santos to miss out. Michael has had international scouts watching him and he will get that international call-up soon, while Premier League teams have been scouting Ricardo and it won’t be too long before those top teams are knocking on our door asking about him. Gareth McAuley, Craig Dawson and Jonas Olsson are all doubts for the London Road tie having picked up knocks in Saturday’s 1-0 defeat at Newcastle United meaning the Baggies could have just three fit senior defenders as former Manchester United player Jonny Evans is also an injury doubt. Those absentees mean one-time Posh loanee James Chester, Cristian Gamboa and Sebastien Pocognoli would be the only fit, available senior defenders. But Westley added: “I can’t concern myself with what team West Brom will put out. If I was with West Brom I would be thinking we can get our attitude spot on, forget about the Premier League, get this job done and we are a step closer to Wembley. “They will field a strong team full of commitment, We will have to match that and hope we can play better on the night.